Your Grace is Sufficient: Who's the Greatest? If you have been a fan of world class boxing back in the 60s and 70s, there can only be one answer to the question: “Who is the Greatest?” Spontaneously, you would have shouted “Muhammad Ali!” Who could forget his personal tag-line which rhymed with his name, “Float like a butterfly, sting like a bee?” “The Greatest” had become this three-time heavy weight boxing world champion’s self-styled personal accolade. 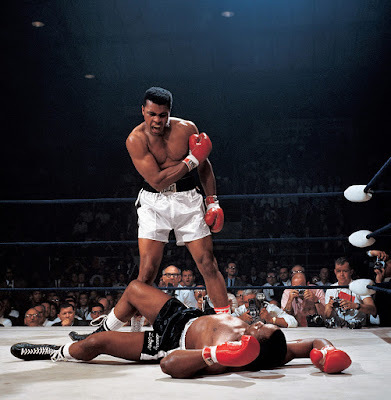 Few of us may have the size of Muhammad Ali’s ego to even claim to come anywhere close to being “the Greatest,” but this question continually lurks at the back of our minds as we ponder and assess the power dynamics of those around us and our own little spot therein: “Who is the greatest?” When you walk into a room, look around. Who has the most power? Who gets the best seat? Who has the right to speak first or interrupt? Who sets the agenda and has the greatest ability to turn their will into reality, change intent into action? Jesus was aware of power dynamics and had a very specific approach to them. We should too. “Who is the greatest?” This question might seem delusional to some and childish to others, but for those who first followed the Lord it was a very real question. Being Asians, we can probably somewhat grasp how deeply status is ingrained in so many cultures, and certainly this was the case of the culture from which the gospels come to us. Your standing affected how you lived your life from day to day, how you related to other people and they to you. It was of utmost importance to a person’s self-worth in terms of how he was regarded by his community. Working out the appropriate honour and respect due to an individual was a constant task whether in worship, or in discussions, or in eating family meals, or receiving guests and seating them, or greeting people in public and so on. The disciples were no different to anyone else in asking such a question. The real difference comes with what the Lord has to say on the subject. Christian culture would have to take a radical departure from this cultural norm of placing rank and status as values to be sought and pursued. During His public ministry, the status and reputation of the Lord had grown from that of someone unknown to that of a great prophet, teacher and healer. But now He is alone with His disciples minus the crowds. It’s obvious that His message is not meant to please the audience. He then delivers this bombshell “the Son of man will be delivered into the hands of men, and they will kill him; and when he is killed, after three days he will rise." The way Jesus puts it, there is no question of it not being true. It will happen. Moreover, Jesus doesn’t just say it once. He goes on saying it to them. But the disciples cannot understand Him. As they were attempting to make sense of Jesus’ predictions, there was another undercurrent that added fuel to the confusion. These disciples who were in the constant company of Jesus, were factious and antagonistic towards one another, quarreling as to which of them was the most important and deserving in the group. When the Lord asked them what they were discussing they were shamefaced about it. And so the Lord speaks to them about status in His kingdom. He says, "If anyone would be first, he must be last of all and servant of all." In effect He tells them that, contrary to cultural norms, they should seek to take the place of the lowest status. Of course He Himself is the first of them to do so when He endured the shame and humiliation of crucifixion. He would abandon Himself to the will of others, becoming the least in that He would put himself at the service of all, even going as far as dying for them. In that way, He would become the greatest, a paradox at the heart of Christianity. As His disciples, they too should emulate His example. The Lord then took a child as a visual aid. The Aramaic word for ‘child’ is also the word for ‘servant’ and to understand the implications of this, we must realise that cultural view of children is quite different from our perception. Then, children were totally at the mercy of adults, unlike today where adults are at the mercy of children. Today’s children have been shaped by a culture of entitlement. But the children of first century Palestine were not demanding expensive toys from their parents or clamouring for the latest smart phones or tablets because everyone else at school had them. Children during Jesus’ time had absolutely no rights (human rights being a relatively modern innovation). The key point about the child is that, in that time and place, a child had absolutely no status whatsoever. A child was totally dependent on others and in this sense powerless. It is this kind of child that our Lord tells His disciples to receive. By putting the unimportant child, the child which all the adults ignore, the child whose opinion has no value in their eyes, in the centre of the room, He gives the child the most important place. The one of no status is given the position of greatest honour. The last is placed first. Note here that unlike the other gospels, our Lord does not ask His disciples to become like that child. Rather, the invitation is to receive that child, which is to look after him. It is in receiving such a person, notwithstanding his or her total lack of standing or status or importance, that a follower of Christ will receive God the Father. Jesus turns their whole way of looking at themselves and others completely upside down. Yes, we do live in a culture and society that gives great significance to status and rank. Perhaps, it is further compounded by the culture of entitlement. Entitlement creates an inward, self-focused, self-centred person. The heart of entitlement is that we deserve to be respected, to be regarded as important, our rights are to be safeguarded, benefits are to be accorded to us, and we deserve to be treated as “special.” We come to believe that our parents owe us, our society owes us, the world owes us and the Church owes us. Why should God be exempted from this list?